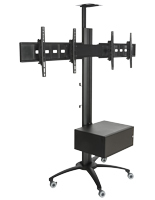 Need a way to make teleconferencing easy? 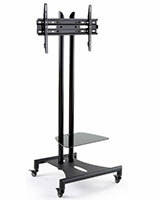 This conference TV stand can hold a monitor, a camera and other electronics for a number of applications. 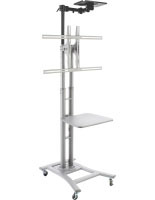 Each mount is made of aluminum or steel and features a number of shelving options. 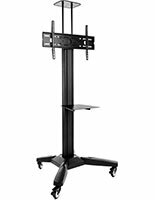 A conference TV stand, or videoconferencing screen holder, are available in a neutral black, white or mahogany finish that will match any interior. 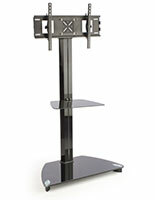 Their design is modern, but will not distract from the content on the display. 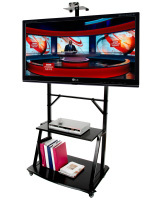 This type of commercial TV stand is commonly seen in a classroom, an office boardroom, or a trade show. 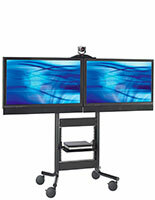 How versatile are these videoconferencing displays? 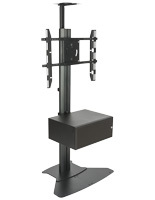 All of the conference TV stands in this category adjust in some fashion. 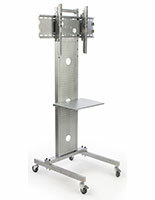 Some extend the screen upwards or downwards while others tilt 15 degrees or rotate to display flat panels horizontally or vertically. 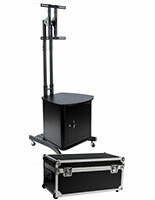 Some models feature a portable design. 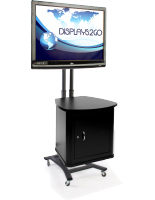 This type of pedestal folds and comes with a carrying case, allowing them to be brought to other boardrooms or to events like trade shows. 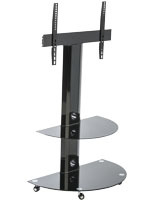 Each LED TV stand features a different shelving setup. 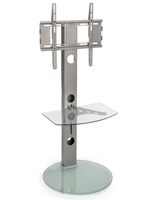 These include shelves with a rectangle, half circle or trapezoid shape, made of metal, MDF or tempered glass. 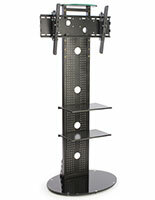 This shelving can rotate, move from one area to another, and much more. 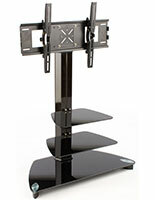 This type of home and office flat screen mounts features more adjustability functions. 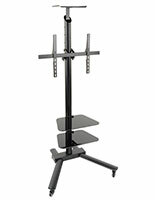 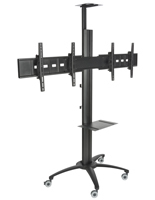 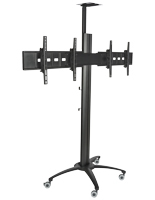 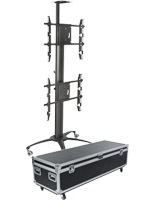 These universal TV stands can accommodate a monitor measuring between 20" and 84"+ wide, depending on the model. 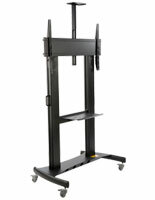 They also have a weight limit that varies from unit to unit. 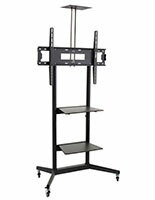 Some plasma racks can be displayed in both landscape and portrait orientations allowing them to create interesting digital signage. 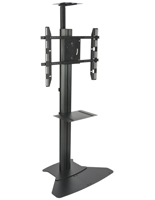 These videoconferencing mounts also come with four locking wheels attached to the base make them easy to maneuver them from one area to another. 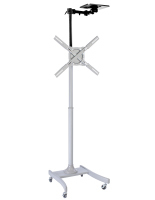 In addition, some models feature a height adjustable design for extra visibility. 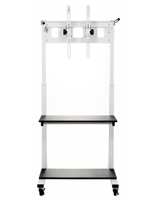 Who uses these flat panel workstations? 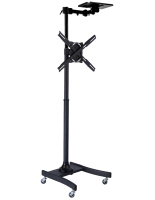 In office buildings, place one of these fixtures in a boardroom for presenting at meetings, or in break rooms or lobbies for showcasing public information. 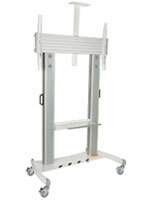 Doctors, nurses, and hospital technicians often utilize these showcases at work. 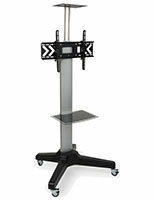 The television is great for analyzing test results from EKG machines and the like. 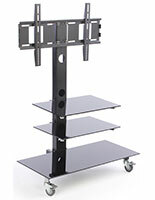 A tempered glass shelf space offers an area for them to keep track of the onscreen information. 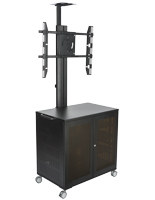 Schools and libraries use these fixtures as multimedia centers. 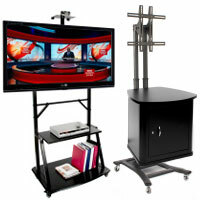 Students and patrons follow onscreen images while using the desk space in front of them. 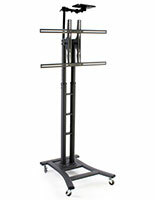 Trade show booth operators use these racks to attract customers to their kiosk. 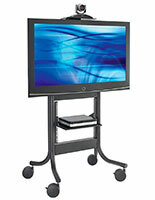 They provide supplemental advertisements while letting customers interact with the screen while standing at a desk. 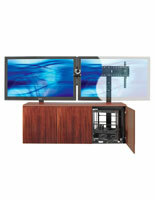 Their countertop is also a great place for laptops, media players, and other accessories. 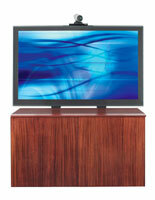 LED TV stands with a mahogany finish are ideal for upscale interiors. 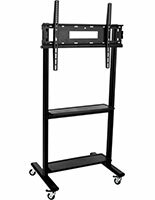 Their attractive design includes a lower cabinet for storing DVD and Blu-Ray players, video game consoles and physical media. 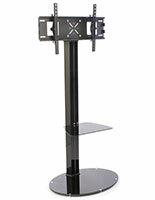 With their included camera shelf, they are used for videoconferencing from office to office. 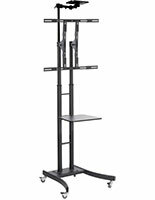 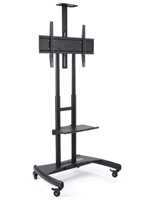 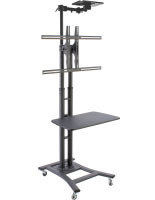 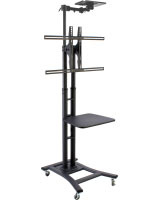 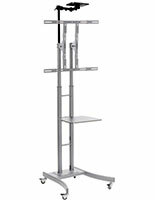 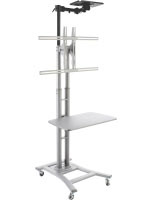 Some stands with a metal or glass shelving come with a storage cabinet for storing supplies. 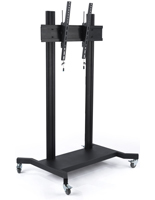 These can feature a locking function for extra security. 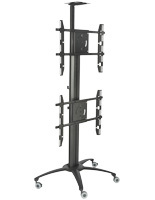 Our commercial TV fixtures are high quality displays intended for long-term use. 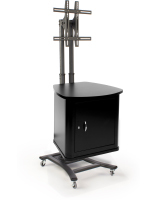 Their strong steel or MDF fabrication will withstand high traffic environments, making them excellent for event use. 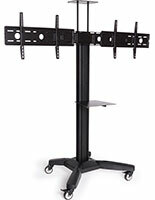 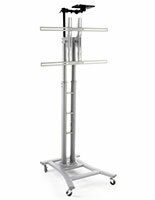 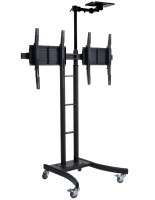 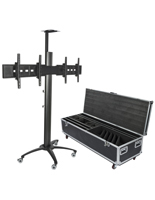 For wholesale pricing, buy online from TVStandsOnly.com!